Are you looking for ways to convert PDF files into AZW format? AZW is a Kindle eBook format. It is a MobiPocket eBook file that is protected by digital rights management (DRM) and renamed from MOBI or PRC. AWZ files are widely used on Amazon's Kindle eBook reader devices, so you might often see this file format when downloading and transferring Kindle reading materials to your devices. With the advancement of technology, you can easily convert multiple PDF files into AZW file format by using tools available online. One of the most popular PDF to AZW file converter tools is Online Converter. 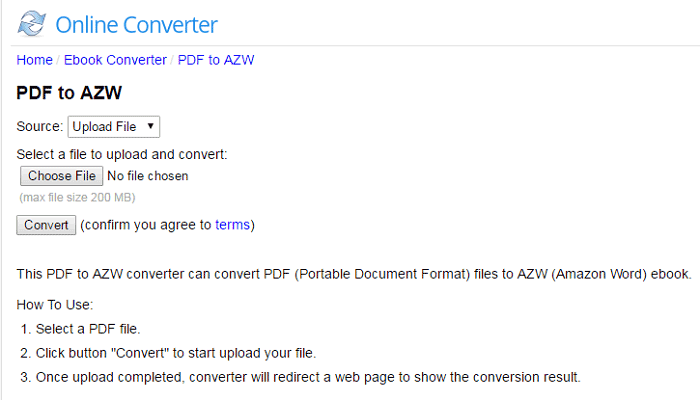 Below are the steps needed to use Online Converter for converting PDF to AZW. Step 2. Select the PDF file by choosing the option 'Upload File' and 'Browse'. Step 3. Once the PDF file is uploaded, click on the button 'Convert'. This will start the uploading file process. Step 4. Once the file is converted, you will be directed to a new webpage which will show the conversion result (and the download link). There is a chance the upload process will stall, and you'll need to restart the entire process. The converter is not able to convert files that are protected or encrypted. There aren't many online converters which can produce high-quality conversion. The process of converting PDF to AWZ file format can be a tricky one. Therefore, choosing the right solution (tools and software) to have a smooth conversion is important. PDFelement is a powerful software that comes with a complete set of professional tools to help you edit, combine, transform and organize PDFs with ease. With this software, you can easily perform many changes to the file such as changing the text and images, as well as modifying the pages of your PDF with ease. The OCR function turns image-based PDFs into editable file while ensuring numbers and images can be detected correctly. PDFelement also lets you transform PDF files into major file formats such as Word, PPT, Excel, images and more. The software is also able to retain the original layout which ensures that you can work on the document without losing quality. Last but not least, PDFelement also comes with the automatic form filling feature which automatically highlights fillable fields in the PDF forms. You also have the option to create personalized forms.